In this chapter we will look at and offer solutions to three problems from a sample programming exam. While solving them we will put into practice the methodology described in the chapter "Methodology of Problem Solving". We are given HTML file named Problem1.html. Write a program, which removes all HTML tags and retains only the text inside them. Output should be written into the file Problem1.txt. The first thing that occurs to us as an idea for solving this problem is to read sequentially (e.g. line by line) the input file and to remove any tags. It is easily seen that all tags starting with the character "<" and end with the character ">". This also applies to opening and closing tags. This means that for each line in the file we should remove all substrings starting with "<" and ending with ">". We have an idea for solving the problem. Whether the idea is correct? First we should check it. We can ensure it is correct for the sample input file, and then consider whether there are specific cases where the idea could be incorrect. - There are tags containing text that open and close at separate lines. Such tags in our example are <html>, <body> and <a>. - There are tags that contain text and other tags in themselves (nested tags). For example <body> and <html>. If we remove all the text in tags and snap the other text, we will get words that are stuck together. From the task’s description it is not clear if this is the requested result or it must be as in the HTML language. In the HTML language each series of separators (spaces, new lines, tabs, etc.) appear as a space. However, this was not mentioned in the task’s description it is not clear from the sample input and output. It is yet not clear from the description, how to display the text that is located on a few lines inside a tag. The first thing to do when we find ambiguity in the description of the task is to read it carefully. In this case the problem statement is not really clear and does not give us the answers. Probably we should not follow the HTML rules, because they are not described in the problem statement, but it is not clear whether to connect the words in neighboring tags or separate them by a space or new line. So, after adapting these new requirements, the following idea comes: read file line by line and substitute each tag with a new line. To avoid duplication of new lines in the resulting file, replace every two consecutive lines of new results with a new line. We check the new idea with the example from the original statement of the problem with our example to ensure it is correct. It remains to implement it. - Read the input file. 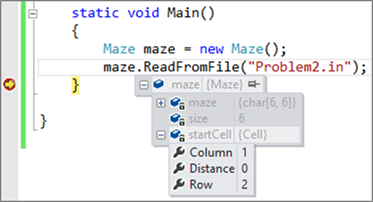 - Processing of a line of input file: replace tags with a new line. - Print results in the output file. What Data Structures to Use? In this task we must perform simple word processing and file management. The question of what data structures to use is not a problem – for word processing we use string and if necessary – StringBuilder. If we read the lines one by one, it will not be a slow operation. Processing of one line can be done by replacing some characters with others – a quick operation. We should not have performance problems. A possible problem could be the clearing of the empty lines. If we collect all lines in a buffer (StringBuilder) and then remove double blank lines, this buffer will occupy too much memory for large input files (for example 500 MB input file). To save memory, we will try to clean the excess blank lines just after the replacement tags with the white space character. Now we examined the idea of solving the task, we ensured that it is good and covers the special cases that may arise, and believe we will have no performance issues. Now we can safely proceed to implementation of the algorithm. We will write the code step by step to find errors as early as possible. With this code we will read the input file line by line. Let’s think whether we have completed a good first step. Do you know what we have missed? From the code written we will read the input file, but only if it exists. What if the input file does not exist or could not be opened for some reason? Our present decision does not deal with these problems. There is another problem in our code too: if an error occurs while reading or processing the data file, it will not be closed. With File.Exists(…) we will check if the input file exists. If not – we will display an appropriate message and stop program execution. To avoid the second problem we will use the try-catch-finally statement (we may use the using statement in C# as well). Thus, if an exception arises, we will process it and will always close the file, which we worked with. We must not forget that the object of the StreamReader class must be declared outside the try block, otherwise it will be unavailable in the finally block. This is not a fatal error, but often made by novice programmers. It is better to define the input file name as a constant, because we probably will use it in several places. We are convinced that the code till now is correct. Let’s move to the next step of the implementation of our idea (algorithm). Now we want to find a suitable way to remove all tags. How should we do this? One possible way is to check the line character by character. For each character in the current row we will look for the character "<". On the right side of it we will know that we have a tag (opening or closing). The end tag character is ">". So we can find tags and remove them. To not get the words connected between adjacent tags, each tag will be replaced with the character for a blank line "\n". Everything works perfectly, only that we have extra blank lines. Can we remove them? This will be our next step. As always, before we move forward, we test whether the method works correctly. We try a text, which has no blank rows, and then add 2, 3, 4 and 5 blank lines, including at the beginning and at the end of text. We find that the above method does not work correctly, when there are 4 blank lines one after another. For example, if we submit as input "ab\n\n\n\ncd", we will get "ab\n\n\cd" instead of "ab\ncd". This defect occurs because the Replace(…) finds and replaces a single match, scanning the text from left to right. If in result of a substitution the searched string reappears, it is skipped. The above code uses a regular expression to find any sequence of \n characters and replaces it with a single \n. This removes most of the blank lines, but not all. The method works very simply: goes from left to right and skips all newline characters. Then passes from right to left and skips again all newline characters. If the left and right positions have passed each other, this means that the string is either empty or contains only newlines. Then the method returns an empty string. Otherwise it returns back everything to the right of the start position and to the left of the end position. As always, we test whether the above method works correctly with several examples, including an empty string, no string breaks, string breaks left or right or both sides and a string with new lines. We make sure, that the method now works correctly. It remains to print the results in the output file. To print the results in the output file we will use the StreamWriter. This step is trivial. We must only consider that writing to a file can cause an exception and that’s why we need to change the logic for error handling slightly, opening and closing the flow of input and output to the file. Until now, we were testing the individual steps for the solution of the task. Through the tests of individual steps we reduced the possibility of errors, but that does not mean that we should not test the whole solution. We may have missed something, right? Now let’s thoroughly test the code. - Test with the sample input file from the problem statement. Everything works correctly. - Test our "complex" example. Everything works fine. - Test the border cases and run an output test. - We test with a blank file. Output is correct – an empty file. - Test with a file that contains only one word "Hello" and does not contain tags. The result is correct – the output contains only the word "Hello". - Test with a file that contains only tags and no text. The result is again correct – an empty file. It seems we found a small defect. There is a space at the beginning of some of the lines. We fixed that error too. Now we have only to change this name to a more appropriate one, for example RemoveNewLinesWithWhiteSpace(…). Now we need to test again after the “fixes” in the code (regression test). We put new lines and spaces scattered randomly and make sure that everything works correctly now. One last test remains: performance. We can create easily create a large input file. We open a site, for example http://www.microsoft.com, grab the source code and copy it 1000 times. We get a large enough input file. In our case, we get a 44 MB file with 947,000 lines. Processing it takes under 10 seconds, which is a perfectly acceptable speed. When we test the solution we should not forget that the processing of the file depends on our hardware (our test was performed in 2009 on an average fast laptop). Did you see how testing is useful and how testing is important? In some big companies (like Microsoft) having a solution without tests is considered as only 50% of the work. This means that if you write code for 2 hours, you should spend on testing (manual or automated) at least 2 more hours! This is the only way to create high-quality software. What a pity that we discovered the problem just now, instead of at the beginning, when we were checking whether our idea for the task is correct, before we wrote the program. Sometimes it happens, unfortunately. How to Fix the Problem with the Tag at Two Lines? The first idea that occurs to us is to load in memory the entire input file and process it as one big string rather than row by row. This is an idea that seems to work but will run slow and consume large amounts of memory. Let’s look for another idea. The missing PrintBuffer(…) method should clean the whitespace from the text in the buffer and print it in the output followed by a new line. Exception is when we have whitespace only in the buffer (it should not be printed). The input file is read character by character with the class StreamReader. - If we get to the end of file, we print whatever is in the buffer and the algorithm ends. - When we encounter the character "<" (start tag) we first print the buffer (if we find that the transition is from text to tag). Then we clear the buffer and set inTag = true. - When we encounter the character ">" (end tag) we set inTag = false. This will allow the next characters after the tag to accumulate in the buffer. - When we encounter another character (text or blank space), it is added to the buffer, if we are outside tags. If we are in a tag the character is ignored. Printing of the buffer takes care of removing empty lines in text and clearing the empty space at the beginning and end of text (trimming the leading and trailing whitespace). How exactly we do this, we already discussed in the previous solution of the problem. In the second solution the processing of the buffer is much lighter and shorter, so the buffer is processed immediately before printing. In the previous solution of the task we used regular expressions for replacing with the static methods of the class Regex. For improved performance now we create the regular expression object just once (as a static field). Thus the regular expression pattern is compiled just once to a state machine. It remains to test thoroughly the new solution. We have to perform all tests conducted on the previous solution. Add test with tags, which are spread over several lines. Again, test performance with the Microsoft website copied 1000 times. Assure that the program works correctly and is even faster. Read the free book by Svetlin Nakov and team for developing with Java. As we know, in the solution of the task we use Boolean variable (inTag), to know whether the current character is in the tag or not. On the figure above we have shown that in moment 1 we set inTag = true. So far so good. Then comes moment 2, where the current character read is ">". At this point we find inTag = false. The problem is that the tag, which is open from moment 1 is not yet closed, and the Boolean variable indicates that we are not in the tag anymore and the following characters are saved in the buffer. If between the two tags for a new line (<br />) we have text, it would also be saved in the buffer. - If we get to the end of the file, print whatever is in the buffer and the algorithm ends. - When we encounter the character "<" (start tag) first we print the buffer (if we find that the transition from text to the tag). Then we clear the buffer and increase the counter by one. - When we encounter the character ">" (end tag) we reduce the counter by one. Closing of a nested tag will not allow accumulation in the buffer. If after closing a tag we are out of all tags, the characters will begin to accumulate in the buffer. - When we encounter another character (text or blank space), it is added to the buffer, if we are outside all tags. If we are inside a tag – the character is ignored. Again we test the solution of the problem. We perform all tests made on the previous solution (see section "Testing the Solution"). We also try the site of MSDN (http://msdn.microsoft.com). Let’s carefully check the output file. We can see that at its end the file contains wrong characters (in April 2011). After carefully reviewing the source code of the MSDN site, we notice that there is an incorrect representation of the character ">" (to visualize this character in the HTML document "&gt;" should be used, not ">"). However, this is an error in the MSDN site, not in our program. Now it remains to test the performance of our program with the site of this book (https://www.introprogramming.info) copied 1000 times. We assure that the program works fast enough for it too. Finally we are ready for the next task. Two of the squares are neighboring, if they have a common wall. In one step Jack can pass from one passable square to its neighboring passable square. If Jack steps in a cell, which is on the edge of the labyrinth, he can go out from the labyrinth with one step. Write a program, which by a given labyrinth prints the minimal number of steps, which Jack needs, to go out from the labyrinth or -1 if there is no way out. The input data is read from a text file named Problem2.in. On the first line of the file is the number N (2 < N < 100). On the each of next N lines there are N characters, each of them is either "0" or "x" or "*". The output is one number and must be in the file Problem2.out. We have a labyrinth and we should find the shortest path in it. This is not an easy task and we should think a lot or we should read somewhere how to solve such kinds of tasks. Our algorithm will begin its movement from the initial point we are given. We know we can move to a neighboring cell horizontally or vertically, but not diagonally. Our algorithm must traverse the labyrinth in some way, to find the shortest path in it. How to traverse the cells in the labyrinth? One possible decision is the following: we start from the initial cell. Move to one of its neighboring cells, after this in a neighboring cell of the current (which is passable and still unvisited), after this in a neighboring cell of the last visited (which is passable and still unvisited) and we go on forward recursively until we reach an exit of the labyrinth, or we reach a place where we can’t continue (there is no neighboring cell which is free or unvisited). In this moment we go back from the recursion (to the previous cell) and visit another neighboring cell for the previous cell. If we can’t continue, we go back again. The described recursive process is the process of traversing the labyrinth in depth (remember the chapter "Recursion" and DFS traversal). The question “Is it needed to walk through one cell more than once” occurs to us? If we walk through one cell at most once, we can walk through the whole labyrinth faster and if there is an exit, we will find it. But will this be the minimal path? If we draw the whole process on a paper, we will find out quickly the path will not be the minimal. If we mark the cell we leave on the way back of the recursion as free, this will allow us to reach each cell repeatedly, coming from a different path. The full recursive walk of the labyrinth will find all possible paths from the initial cell to any other cell. From all the found paths we can choose the shortest path to a cell on the bound of the labyrinth (exit) and that’s how we will find a solution for the problem. It seems we have an idea for solving the problem: with recursive walk we find all the possible paths in the labyrinth from the initial cell to a cell on the bounds of the labyrinth and from all these paths we choose the shortest one. Let’s check the idea. We take a sheet of paper and make one example of the labyrinth. We try the algorithm. It’s obvious it finds all the paths from the initial cell to the one of the exits and it travels a lot forwards-backwards. As a result it finds all exits and among all paths it can be chosen the shortest one. Does the idea work if there is no exit? We create a second labyrinth, which is without exit. We try out the algorithm on it, again on a sheet of paper. We see after long circulation forwards-backwards that the algorithm does not find an exit and finishes. It looks we have a correct idea for solving the problem. Let’s move forward and think for the data structures. First, we have to decide how to store the labyrinth. It’s natural to use a matrix of characters, just as the one on the figure. We will consider that one cell is passable and we can enter it, if it has a character, different from the character 'x'. We can store the labyrinth in a matrix of numbers and Boolean values, but the difference is not significant. The matrix of characters is comfortable for printing, and this will help us while debugging. There are not many options. We will store the labyrinth in a matrix of characters. After this, we have to decide in what structure to keep the visited through the recursion (current path) cells. We always need the last visited cell. This leads us to a structure, which is “last in, first out”, i.e. stack. We can use Stack<Cell>, where Cell is a class, containing the coordinates of one cell (number of row and number of column). It remains to think where to keep the found paths, to find the shortest of them. If we think of it, it is not necessary to keep all the paths. It is enough to keep the current path and the shortest till this moment. It’s not even necessary to keep the shortest path till this moment but only its length. Every time we find a path to an exit of the labyrinth we can take its length and if it is shorter than the shortest path to this moment to keep it. It seems we found efficient data structures. According to our recommen­dations for problem solving, it is early to write the code of the program, because we have to think of the efficiency of the algorithm. Let’s check our idea against efficiency. What are we doing? We find all the possible paths and we take the shortest. There’s no argument the algorithm will not work, but if the labyrinth is way bigger, will it work fast? To answer this question, we should think how much paths there are. If we take an empty labyrinth, on the each step of the recursion we will have an average number of 3 free cells to go (without the cell we are coming from). If we have for example a labyrinth 10x10, the path could be 100 cells and while we travel on each step we will have 3 neighboring cells. It seems the numbers of paths are sort of 3 to the power of 100. It’s obvious the algorithm will slow down the computer very much and very fast. We found a serious problem with the algorithm. It will work very slowly, even with small labyrinths, and with bigger ones it will not work at all! The good news is that we haven’t written a single line of code and the general change of our approach to the problem will not cost us much time. We found that walking through all the paths in the labyrinth is wrong approach, so we have to think of another. Let’s start with the initial cell and walk through all its neighboring cells and mark them as visited. For each visited cell we can keep a number equal to the number of cells, which we have travelled to reach it (the length of the minimal path from the initial cell to the current cell). 1. Write the length of the path 0 for the initial cell. Mark it as visited. 2. For each neighboring cell to the initial we mark the length of the path is 1. Mark these cells as visited. 3. For each cell, which is, neighboring to a cell with length of the path 1 and it is not visited, write the length of the path is 2. Mark the cells as visited. 4. Continuing analogous, on the N step we find all the still unvisited cells, which are on a distance of N moves from the initial cell and mark them as visited. To check whether the new idea for solving the “Escape from the Labyrinth” problem is correct we can visualize the process. We take another labyrinth to test our idea in a better way. At each step k our goal is to fill with the number k all cells that can be reached in k steps. If at step 0 we fill the initial cell with 0, at step 1 we fill all cells reachable in 1 step from the initial cell, at step 2 we fill all cells reachable in 2 steps, etc. we will be sure that when we fill a cell with a number, this number reflects the minimal number of steps to reach this cell starting from the initial cell, right? Continuing this way, in a moment either we will reach a cell at the edge of the labyrinth (an exit) or we will find such a cell is unreachable. It seems like our algorithm works correctly. It will either find an exit or will find that there is no reachable exit. If at some step an exit is found, the path to it will be guaranteed to be the shortest possible (otherwise the exit should already be found at some of the earlier steps). Having invented the idea for solving the labyrinth escaping problem, it will be easy to break it into subproblems. The main subproblems could be: reading the input labyrinth, finding the shortest path to some of its exits and printing the results. The path finding subproblem could be further divided into subproblems (steps) which we discussed in the previous section. Because we never visit a cell more than once, the number of steps, which this algorithm does, should not be big. For example, if we have a labyrinth with size 100 x 100, it will have 10,000 cells, we will visit each of the cells at most once and for each of them we will check every neighbor if it is free, i.e. we will check 4 times each cell. At the end we will do at most 40,000 checks and we will visit at most 10,000 cells. We will do a total amount of 50,000 operations. This means the algorithm will work instantly. It seems this time we don’t have a problem with the performance. We have a fast algorithm. Let’s check if it is correct. For this purpose we draw a bigger and more complex example on a sheet of paper, which has many exits and a lot of paths, and we begin to perform the algorithm. After this we try with a labyrinth with no exit. It seems the algorithm ends, but does not find an exit so it’s working. We try another 2-3 examples and convince ourselves this algorithm always finds the shortest path to an exit and always works fast, because it visits each of the cells of the labyrinth at most once. With the new algorithm we walk consequently through all neighboring cells to the initial cell. We can put them into a data structure, for example in an array or better a list (or list of lists), because we can’t add in the array. Then we take the list of the reached cells on the last step and we add their neighbors in another list. That’s how if we index the lists we have list0, which contains the initial cell, list1, which contains passable neighboring cells to the initial, after this list2, which contains passable neighbors to list1 and so on. At the N step we have the listn, which contains all the cells, which we can reach in exactly N steps, i.e. which are at a distance of n from the initial cell. It seems we can use a list of lists, to keep the cells on each step. If we think about it, to get the n list, we need the (n-1)-list. So it seems we don’t need list of lists but only the list from the last step. We can make general conclusion: cells are processed in the order of entry: when the cells of step k are finished, then we process the cells from step k+1, and just after them – the cells from step k+2, and so on. The process seems like a queue: earlier accessed cells are processed earlier. If we dig a bit inside, we will conclude, that we have just re-invented the Breadth-First-Search algorithm (read about BFS in Wikipedia). To implement the BFS algorithm we can use a queue of cells. For this purpose we have to define class Cell, which contains the coordinates of given cell (row and column). We can keep the distance from each cell to the initial cell in a matrix. If the distance is not calculated yet, we store -1. If we think a little more, the distance from the initial cell can be kept in the cell itself (in the class Cell) instead of creating a special matrix for the distances. That way we will save memory. Now we are clear about the data structures. Now we have to implement the algorithm step by step. Generally it is a good idea to test the code after each step, but the above code is too simple to be tested. We will test is later as part of some more complex piece of code. We will read the input file line by line using the well-known class StreamReader. On the each of the lines we will analyze the characters and we will write them in a matrix of characters. When we reach the character "*" we will keep its coordinates in an instance of class Cell to know where to start the searching of the shortest path for getting out of the labyrinth. For simplicity we will skip processing the errors while reading and writing in a file. When an exception occurs we will skip to catch it in the main method and thus we will leave the CLR to print it on the console. We can implement the algorithm directly from what we already discussed. We must define a queue and put in its beginning the initial cell. Afterwards we must take the cell in turn from the queue and add all of its passable unvisited neighbors in a loop. At each step there is a chance to enter in a cell, which is at the border of the labyrinth, and we see we have found an exit and the searching ends. We repeat the loop until the queue is empty. At each visitation of a given cell we check if it is free and if it is, we mark it as impassable. This way we avoid repeatedly visiting the same cell. We’ve made a mistake. The problem is when the variable, in which we keep the initial cell, is initialized with null. This can happen in many scenarios. If the labyrinth has no cells (e.g. size of 0) or the initial cell is missing, the result that the program should return is -1, but not an exception. We retest the code with the typical and the border cases. After the fix it seems the algorithm works correctly now. The algorithm works correctly. The output for each of the test is correct. It remains to test with a large labyrinth (performance test), for example 1000 x 1000. We can make such a labyrinth very easy – with copy / paste. We perform the test and we convince ourselves the program is working correctly for the big test and works extremely fast – there is no delay. While testing we should try every way to break our solution. We run a few more difficult examples (for example a labyrinth with passable cells in the form of spiral). We can put large labyrinth with a lot of paths, but without exit. We can try whatever else we wish. At the end we make sure, that we have a correct solution and we pass to the next problem from the exam. A company is planning to create a system for managing a store for auto parts. A single part can be used for different car models and it has following characteristics: code, name, category (e.g. suspension, tires and wheels, engine, accessories and etc. ), purchase price, sale price, list of car models, with which it is compatible (each car is described with brand, model and year of manufacture, e. g. Mercedes C320, 2008) and manufacturing company. Manufacturing companies are described with name, country, address, phone and fax. Design a set of classes with relationships between them, which model the data for the store. Write a demonstration program, which demonstrates the classes and their all functionality work correctly with some sample data. We have a non-algorithmic problem which is intended to check whether the students at the exam know how to use object-oriented programming (OOP), how to design classes and relationships between them to model real-world objects (object-oriented analysis and design) and how to use appropriate data structures to hold collections of objects. We are required to create an aggregation of classes and relationships between them, which have to describe the data of the store. We have to find which nouns are important for solving the problem. They are objects from the real world, which correspond to classes. Which are these nouns that interest us? We have a store, car parts, cars and manufacturing companies. We have to create a class defining a store. It could be named Shop. Other classes are Part, Car and Manufacturer. In the requirements of the problem there are other nouns too, like code for one part or year of manufacturing of given car. For these nouns we are not creating individual classes, but instead these will be fields in the already created classes. For example in the Part class there will be let’s say a field code of string type. We already know which will be our classes, and fields to describe them. We have to identify the relationships between the objects. We will not check the idea because there is nothing to be proven with examples and counterexamples or checked whether it will work. We need to write few classes to model a real-world situation: a store for car parts. What Data Structures to Use to Describe the Relationship between Two Classes? The data structures, needed for this problem, are of two main groups: classes and relationships between the classes. The interesting part is how to describe relationships. To describe a relationship (link) between two classes we can use an array. With an array we have access of its elements by index, but once it is created we can’t change its length. This makes it uncomfortable for our problem, because we don’t know how many parts we will have in the store and more parts can be delivered or somebody can buy parts so we have to delete or change the data. List<T> is more comfortable. It has the advantages of an array and also is with variable length and it is easy to add or delete elements. So far it seems List<T> is the most appropriate for holding aggregations of objects inside another object. To be convinced we will analyze a few more data structures. For example hash-table – it is not appropriate in this case, because the structure “parts” is not of the key-value type. It would be appropriate if each of the parts in the store has unique number (e.g. barcode) and we needed to search them by this unique number. Structures like stack and queue are inappropriate. The structure “set” and its implementation HashSet<T> is used when we have uniqueness for given key. It would be good sometimes to use this structure to avoid duplicates. We must recall that HashSet<T> requires the methods GetHashCode() and Equals(…) to be correctly defined by the T type. Our final decision is to use List<T> for the aggregations and HashSet<T> for the aggregations which require uniqueness. We start writing classes, which we described in our idea. We will create them in the same sequence as in the list above. Note that the class Car is designed to be immutable. This means that once created, the car’s properties cannot be later modified. This design is not always the best choice. Sometimes we want the class properties to be freely modifiable; sometimes. For our case the immutable design will work well. We are convinced the class Car is correct so far and we can continue with the other classes. We have to implement the definition of the class Manufacturer, which describes the manufacturer for given part. It will have five fields – name, country, address, phone number and fax. The class will be immutable, because we will not need to change its members after creation. We also define the standard method ToString() for representing the object as human-readable string. We test the class Manufacturer just like we tested the class Car. It works. Now we have to define the class Part. Its definition will include the following fields: name, code, category, list with cars, where we can use the given part, starting and closing price and manufacturer. Here we will use the data structure HashSet<Car> to hold all compatible cars. The field that keeps the manufacturer of the part will be of Manufacturer class, because the task requires us to keep additional information about the manufacturer. If it was required to keep only the name of the manufacturer (as in the case with class Car) this class should not be necessary. We would have a field of string type. We need a method for adding a car (object of type Car) to the list of cars (in HashSet<Car>). It will be named AddSupportedCar(Car car). We already have all needed classes for creating the class Shop. It will have two fields: name and list of parts, which are for sale. The list will be List<Part>. We will add the method AddPart(Part part), with which we will add new parts. With a redefined ToString() we will print the name of the shop and the parts in it. It might be a subject of discussion whether we should use List<Part> or Set<Part> for the parts in the car shop. The set data structure has an advantage that it avoids any duplicates. Thus if we have for example few tires of certain model, they will be found only once in the set. To use set we need to be sure the parts are uniquely identified by their code or by some other unique identifier. In our case we assume we could have parts with exactly the same code, name, etc. which come at different buy and sell prices (e.g. if the prices change over the time). So we need to allow duplicated parts and thus using a set will not be appropriate. Parts in the shop will be kept in List<Part>. We will test the class Shop though the especially written class TestShop. We created all classes we need. We have to create one more, with which we will have to demonstrate the usage of the rest of the classes. It will be named TestShop. In the Main() method we will create two manufacturers and a few cars. We will add them to two parts. We will add the parts to the Shop. At the end we will print everything on the console. From the result it seems the first shop is empty and in the second shop the list of cars for the first part is empty. This is the correct output. Therefore our program works correctly with the border case of empty lists. We can continue testing with other border cases (e.g. missing part name, missing price, missing manufacturer, etc. ), as well as with some kind of performance test (e.g. shop with 300,000 parts for 5,000 cars and 200 manufacturers). We will leave this for the readers. There is a requirement for email addresses – <username> can be a sequence of Latin letters (a-z, A-Z) and underscore (_), <host> is a sequence of lower Latin letters (a-z), and <domain> has a limit of 2 to 4 lower Latin letters (a-z). Following the guidelines for problem solving write a program, which finds the valid email addresses and writes them together with the names of the users (in the same format as in the input) to an output file valid-mails.txt. 2. You are given a labyrinth, which consists of N x N squares, and each of them can be passable (0) or not (x).